A couple of months back now I joined this gorgeous little group on Facebook called ‘The Ready Steady Cook Club’. Colin, the lovely founder from The Simple Cook, contacted me through my Instagram feed and asked if I’d like to join. Of course I wanted to… what’s not to love about sharing recipes and chatting all things kitchen creations with other cooks?! We have a little cook off each month whereby those who are able to join in need to cook one or two dishes with the ingredients chosen from one of the group members. This month we had parsnip, leek, passionfruit, salmon and spinach in our little mystery box. We also get a big list of free ingredients, which are the things you would normally find in your pantry that you can use to get a meal together. Such fun! With this bag of ingredients I decided to make parsnip and leek waffles with a smoked paprika poached chicken (I’m not a fish lover so I changed my salmon to chicken – subs in need are allowed!) and a spinach pesto. It was all SO delicious <3 I also made a passionfruit curd, which I haven’t written up yet but I’ll get to it. Savoury waffles have become a thing for me over the past year after buying a waffle iron on a whim – because my tiny kitchen needed one more appliance! I make waffles to go as a side with lots of things because they’re a great accompaniment and they add plenty of flavour to the meal. The leek and parsnip are definitely a great mix. If you’d like to come and join us in The Ready Steady Cook Club Facebook group and get into these cook offs please do. It’s an open group so you should be able to find us easily. It’s full of lots of lovely folk from all over the world and there is a wide variety of cooks in there with varying levels of experience. We have beginners right through to chefs and we all help each other out with questions, answers and encouragement. Some members are bloggers some are not, but it doesn’t matter either way because if you love to cook you’re very welcome! Just a note – this may look a little more complicated than it actually is. The whole process takes about 40 minutes and you’ll definitely be busy while you’re in the kitchen but none of it is difficult. Switch on the tunes and enjoy creating! In a small bowl mix together the paprika, salt and olive oil then pour it all over the shredded chicken and toss to combine (like a salad!). Ensure all the chicken is well coated and if not just make a little more paprika, salt, olive oil mix and toss again. As each one cooks, set aside and keep warm while the next one is on, and add a little more oil to the waffle iron each time so they don’t stick. I just use my thermoserve to keep them warm but they will be fine in a nice low oven too. You’ll have a bit of chicken and pesto left over and they make for great wraps with some rocket thrown in using those delicious Coco Farm turmeric coconut wraps. I buy mine at Taste Organic. For a nut free version: Just replace the cashews with your seeds of choice. 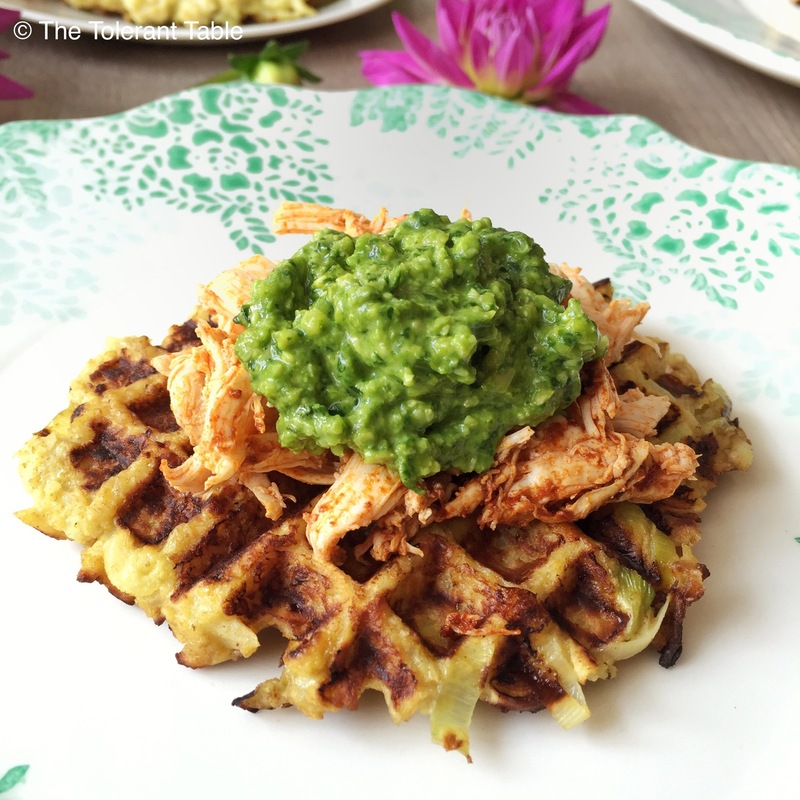 For a low FODMAPs version: Replace the leeks in the waffles with 1 medium carrot, replace the cashews in the pesto with macadamias and leave out the garlic but add in a dash or two of asafoetida to get some pungency back in there. Nutritional yeast flakes have not been checked for FODMAPs as far as I know so just be cautious if you haven’t had them before and notice any symptoms. If they’re an issue for you, just replace them with 1 tsp of white miso. For a low histamine version: Replace the leeks in the waffles with 1 medium carrot, replace the cashews in the pesto with macadamias and leave out the garlic but add in a dash or two of asafoetida to get some pungency back in there. Also replace the spinach with basil. Nutritional yeast flakes have not been checked for their histamine content as far as I know so just be cautious if you haven’t had them before and notice any symptoms. IT looks beautiful! Feeling so inspired to have a go at savoury waffles now! would you be able to suggest another way of cooking the waffle mixture?